Associate Professor Richard Bazinet (pictured left) recently spent two days at the University of Ghana presenting the latest science on the role of fats in the developing brain, to policy-makers, nutritionists and others with a stake in food science and health in Africa. 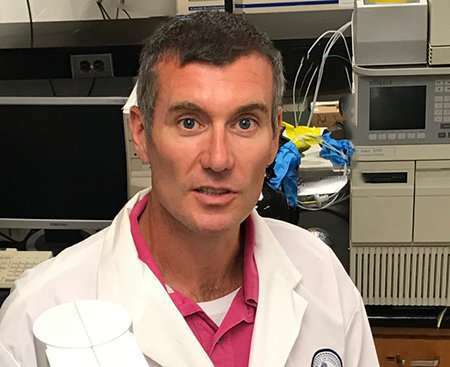 Bazinet holds the Canada Research Chair in Brain Lipid Metabolism in the department of nutritional sciences at the Faculty of Medicine, and he is a researcher in the Joannah & Brian Lawson Centre for Child Nutrition. He spoke with Faculty of Medicine writer Jim Oldfield about infant feeding, the African diet and what research might do for mental health in the country of nearly 30 million. They were sponsored in part by Codex Alimentarius, which is the food standards program of the World Health Organization and the Food and Agriculture Organization of the United Nations. It acts as a kind of 'food code' for the world, especially in developing countries that haven't established their own guidelines on nutritional requirements and food safety. I talked about the state of the science on two fats, ARA from Omega-6s and DHA from Omega 3s – and what a child would need to eat to get optimal values of those fats in the brain. There are several fats in the brain, but ARA and DHA are called essential fatty acids because the body can't make them. So we have to get them from food or supplements. There is evidence these fats improve cognitive and visual development, and central nervous system function. They are important in adults, but even more so in a growing brain, for healthy development. The complicated thing is that it's impossible to do perfect studies showing how much a person needs because we can't access the brain. So we look at models instead and estimate the intake requirements to get ideal brain levels. We actually have pretty good estimates on how much the brain needs, relative to dietary intake. The amounts in breast milk provide a good guide, although they can vary depending on the mother's nutrition. But breast milk is a kind of gold standard. We can also look at infants post-mortem over time for some measurements in the body and brain, and then do back-calculations. These and other sources of data give us roughly similar answers. How might these estimates inform Ghana's guidelines on infant feeding? They might reinforce the importance of breast milk. Breastfeeding rates have been declining in Ghana, and I think well under half of infants are exclusively breastfed at six months. Formula is another big issuebecause not all of it contains ARA and DHA, whereas those are standard in most developed countries. But including them in formula can increase its cost, so that's an added challenge. As for complementary feeding and infant diets broadly, there is a big knowledge gap. Almost all the available studies were done in the U.S. or Europe, or Canada. These countries have relatively good nutrition, and so the worry is that in countries with nutritional challenges – and one-third of children in Ghana are stunted or wasted or underweight – the role of essential fats could be even more important. It's a theoretical argument, but chronic malnutrition in children without fat stores could pose really significant developmental risks, especially in those born premature and in need of more growth. Africa is really understudied in this context. Yes, and these meetings were helpful for making contacts with local scientists who want to look at fatty acid composition in the traditional African diet. It's challenging because there isn't a lot of funding for research. But it might be realistic to start categorizing the African diet and lipids. Ideally we would like to help set them up the equipment and skills to do this work on their own. They could pack up foods and ship them to us to start, but it would be more sustainable to train their students to do it. I've also been emailing with psychiatrists I met at the University of Ghana. Their field is under-resourced, and the setbacks they see in infants can last a lifetime. Some of my work suggests Omega 3s are protective against brain inflammation, which increasingly appears to be at the root of depression and other neurological disorders. Medications to treat these conditions are often unaffordable in Ghana, but maybe we can work with nutrition to limit the burden of mental illness across the lifespan.